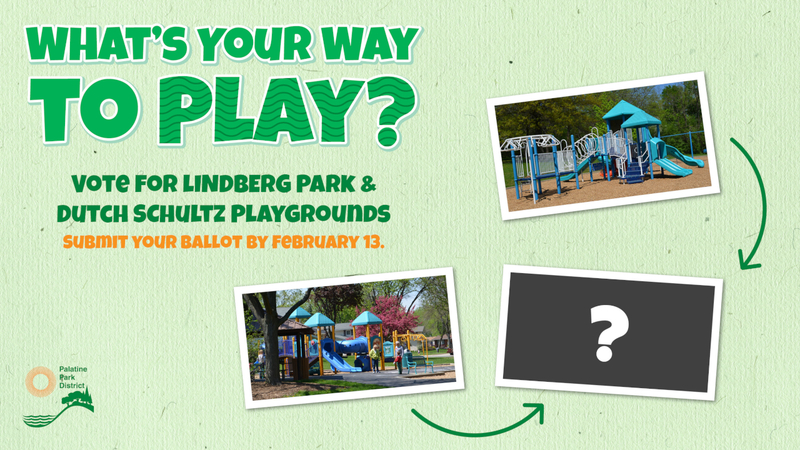 Palatine Park District invites the community to be a part of the decision-making process as staff members select the final amenities for the playgrounds at Doug Lindberg Park, 1313 E. Sanborn Avenue and Robert “Dutch” Schultz Recreation Area, 512 W. Northwest Highway. 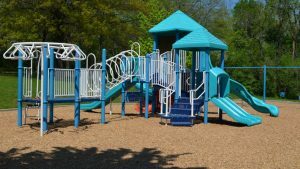 Both playgrounds are scheduled for replacement starting this spring. Doug Lindberg Park is a 10-acre parcel that was received through donations in 1976 from the Winston Muss Company and in 1990 from Kennedy Homes. 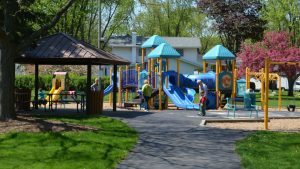 The park includes paths with access to the Palatine Trail, a shelter, athletic fields, and a playground that was last renovated in 2004. A plaque located in the park reminds people of Doug Lindberg, for whom the park was named in 1972. Doug lost his life at the age of 16 when he jumped into nearby Lake Louise to rescue two young children who were drowning. He was a frequent visitor to the park who embodied athleticism and sportsmanship to area children. The ballot for the new Lindberg playground includes choices for color, overhead climbers, slides, deck climbers, and play panels. The Schultz Recreation Area, located along the Palatine Trail at the entrance to Palatine Hills Golf Course, is named for Robert “Dutch” Schultz who served on the Park Board of Commissioners from 1984 to 2009. Palatine Hills has long been one of Dutch’s favorite park district locations. Upon his retirement, the pond, playground, picnic, sledding, basketball, and tennis areas adjacent to the course were renamed in honor of his 25 years of service. The land was acquired as part of the 193-acre golf course between 1965 and 1976 and the playground was last renovated in 2004. The ballot for the Schultz playground includes choices for color, overhead climbers, slides, deck climbers, play panels, and spring riders. Ballots will be accepted through February 13. Ballots are available in person at all three District registration offices, including Birchwood Recreation Center, 435 W. Illinois Avenue; Community Center, 250 E. Wood Street; and Falcon Park Recreation Center, 2195 N. Hicks Road. All ballots will be placed into a random drawing for a Palatine Park District Family Prize Pack with daily pool passes, logo items, and more. Palatine Park District is responsible for 735 acres of open land in Palatine including 50 park and facility locations that are home to 30 playgrounds. The Parks Department inspects and maintains all of the playgrounds to ensure the District is offering safe places to play for the community. Two of the District’s staff members are Certified Playground Safety Inspectors through the National Recreation and Park Association (NRPA) and an additional three staff members are certified playground inspectors through the Park District Risk Management Agency (PDRMA). All of the playgrounds are part of an overall District-wide equipment replacement schedule. Based on inspection results and equipment condition, playgrounds are usually replaced every 14-16 years. The existing equipment from both parks will be removed and re-purposed by Kids Around the World. This organization installs refurbished playground equipment in areas of the world that are often affected by war, poverty, disease, or natural disaster. In addition to providing these additional opportunities for play to children in need, the park district also receives the added benefit of cost savings for the equipment removal. The playgrounds are scheduled to be completed in Summer 2019. Visit the Park District’s Construction Updates page for construction progress. Information regarding playground parties to celebrate the new equipment will be announced on the District’s website as well. For more information about these playground sites, contact Superintendent of Parks and Planning Ed Tynczuk at 847.705.5130 or etynczuk@palatineparks.org.